Mothers who are obese may want to pay special attention to their babies’ nutrient levels. Well, according to a new study, at least one nutrient in particular: vitamin D. Moms who are obese at the beginning of pregnancy might pass on insufficient levels of this important vitamin to their babies. Researchers found that babies born to lean mothers had one-third more vitamin D in comparison to babies born to obese mothers. The key here is that vitamin D is fat-soluble. Overweight and obese people generally have less in their blood, but in this case, all the moms had similar levels of the nutrient by the study’s end. That’s likely because they were taking vitamin D supplements (a good idea). Yet, obese women still transferred less vitamin D to their offspring. This suggests that the vitamin could get stuck in the excess fat and not transfer properly to the baby. We don’t yet know what insufficient vitamin D levels in newborns could mean for them. 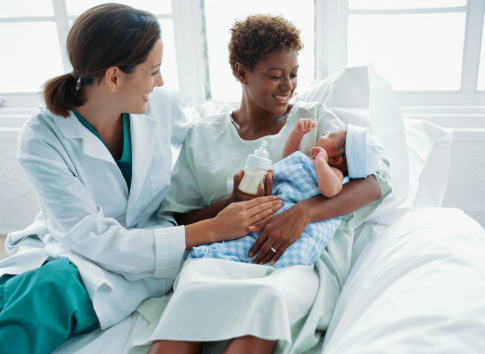 But what we can take away from this study is the importance of shielding newborns from what we know happens to adults with vitamin D insufficiency: greater risk of inflammation, weakened bones, autoimmune diseases, cancer, and obesity. In this study, babies born with higher vitamin D levels had more body fat. This was unusual and in contrast to studies in children and adults. Usually, the higher the vitamin D intake, the lower the fat content. Researchers are going to take the next step of trying to figure out how much vitamin D an obese pregnant woman should take in order to pass it along to her baby while in the womb. The best health advice is that adults get at least 1,000 IU of vitamin D each day. Adults can safely take up to 4,000 IU a day, though a pregnant woman should consult a doctor before edging above 2,000 IU a day. Then, when the baby is born, ensure you purchase vitamin D drops and begin administering them each day. We know a lot about this vitamin, and we have a lot more to learn. But one thing’s for sure: it is incredibly important. Josefson, J., et al., “Maternal Obesity and Vitamin D Sufficiency Are Associated with Cord Blood Vitamin D Insufficiency,” JCEM 2013; 98: 114–119.